The adventures of DaddyBird and Kangayayaroo as they move from the United Arab Emirates to Shanghai, China, and venture to explore the Eastern hemisphere from there. Posted by Kanga. Please do not reblog. 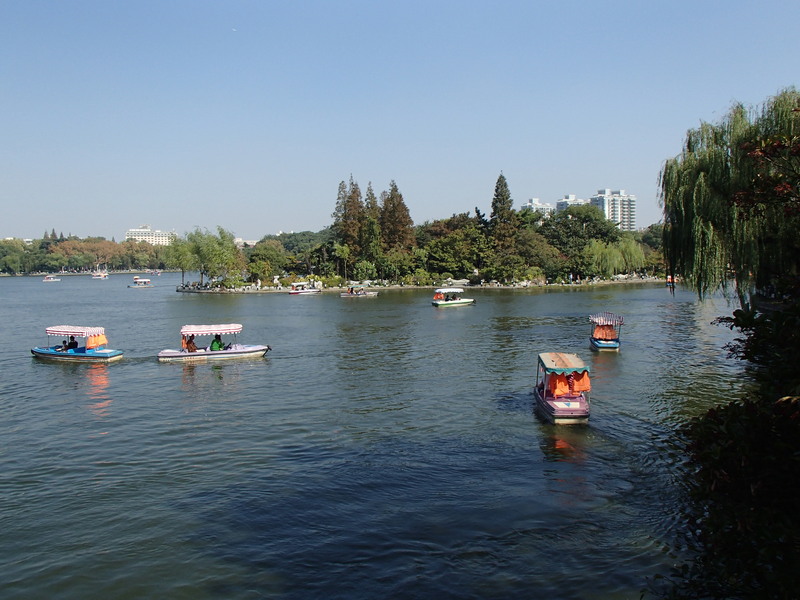 One Saturday in October, our school hosted a staff day trip to Changfeng Park and Aquarium. It was an interesting experience. 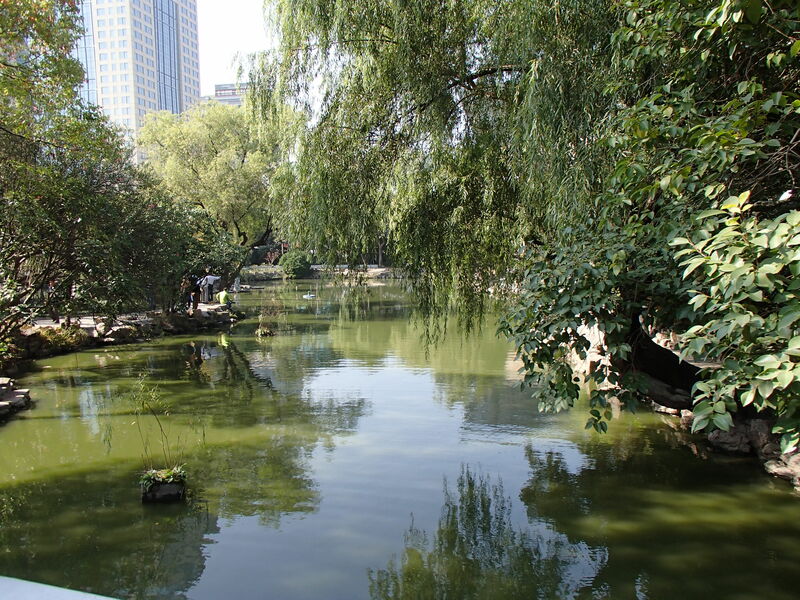 It is a beautiful park with lakes, ponds, trees, and lots of peaceful spots. 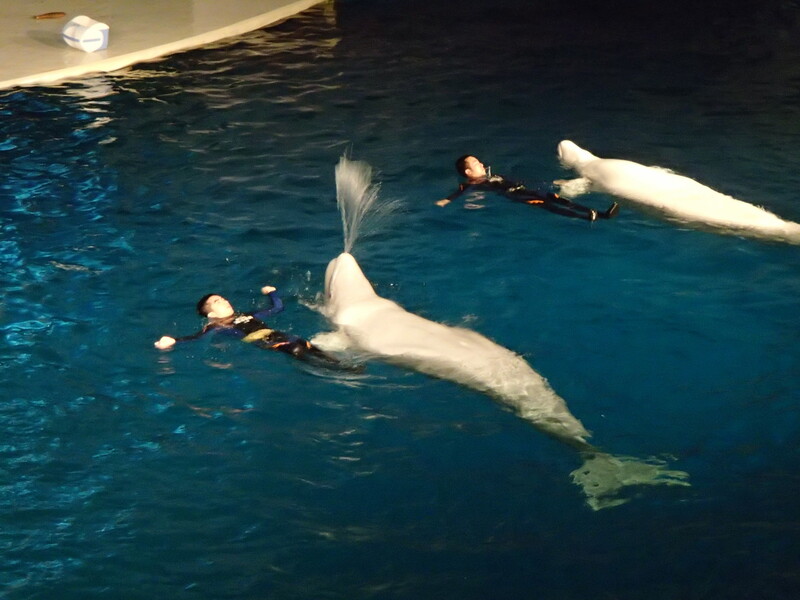 After everyone gathered for a group picture, we took a long walk around the park to the seal and beluga whale show. After that show, we walked all the way back to where we started to enter the aquarium which is literally under the lake. 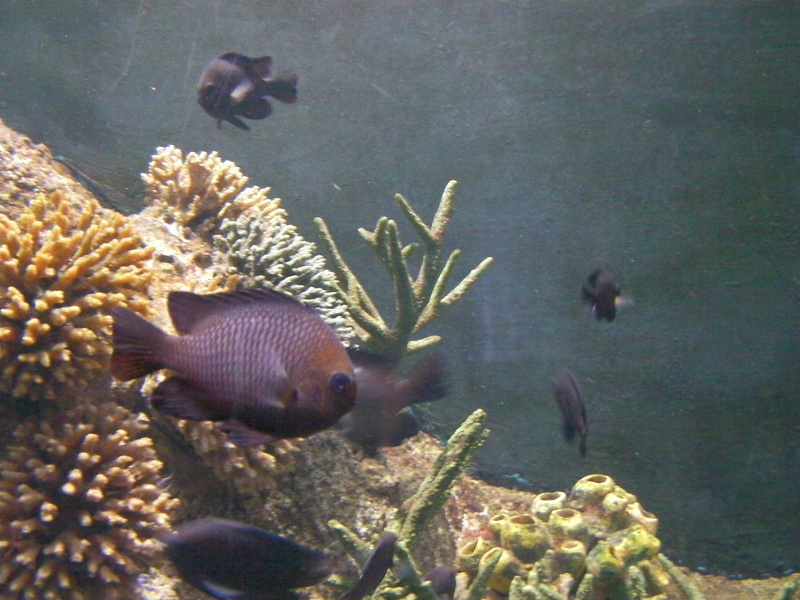 The aquarium displays seemed to be very good, but the crushing crowd made it impossible to really enjoy the experience. It was the worst crowd experience we have had so far. It was especially fun to have the children pushing me from behind. If we go again, it will have to be on an off day like a rainy or extremely cold day, when other people don’t think to go to the park. After nearly five years in the country, we finally got around to going to the Sharjah Aquarium. There were lots of tasty looking groupers. These are also known as hamour, the most commonly eaten fish in the area. Unfortunately, they are now overfished. It doesn’t pay to be so very tasty. 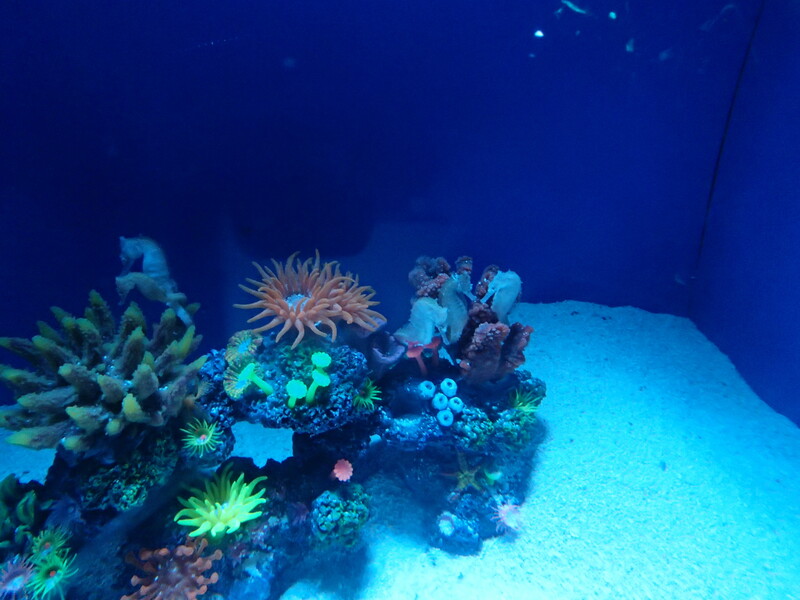 The aquarium is quite pleasant. We were there on a Saturday afternoon and it was fairly quiet and peaceful. As we were leaving around 6 pm more people were arriving, so it may be more populated in the evening. The entrance fee is 20 AED per person and includes admittance to the neighboring Maritime Museum. Well worth it. 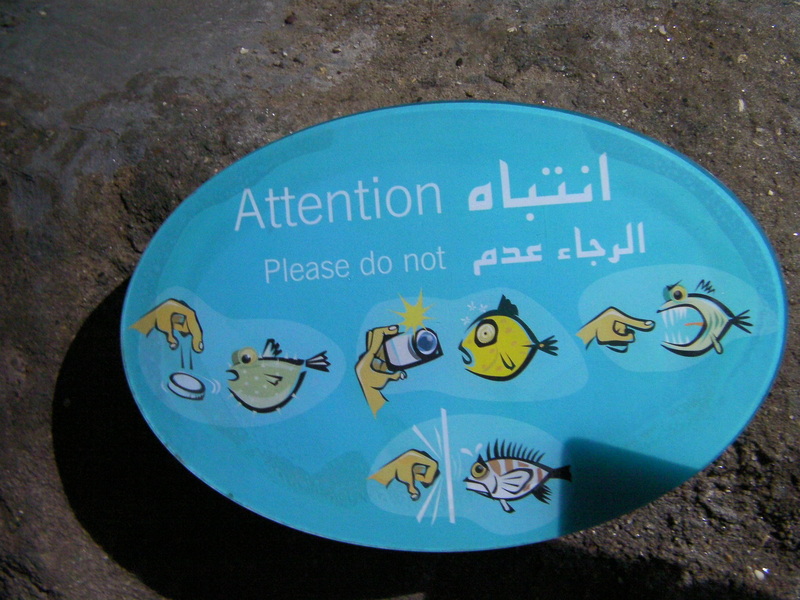 Please don’t pay the fish, flash the fish, feed the fish, or punch the fish. 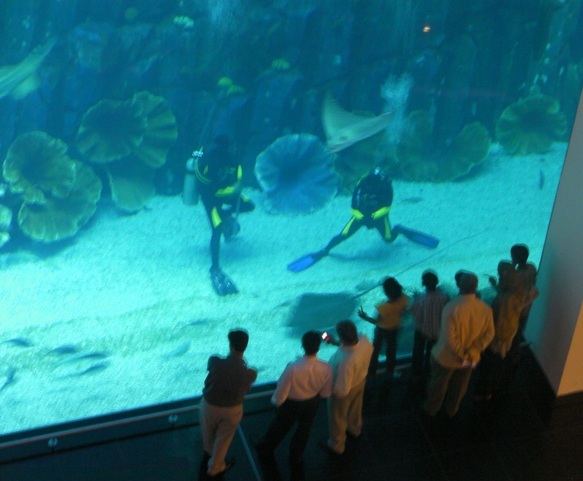 We stopped by the Dubai Aquarium to purchase annual passes and took a quick walk through. 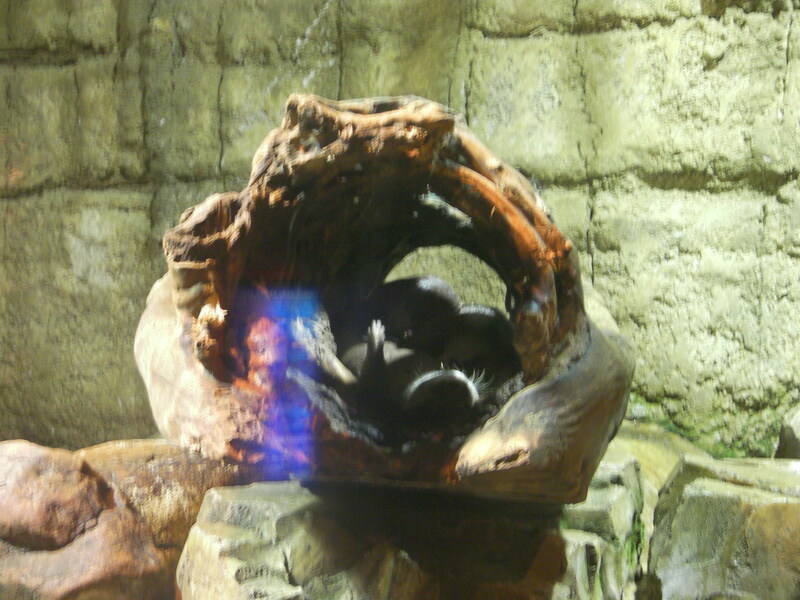 It was Otter nap time. At first we thought these were beavers, but they lacked the appropriate tails. 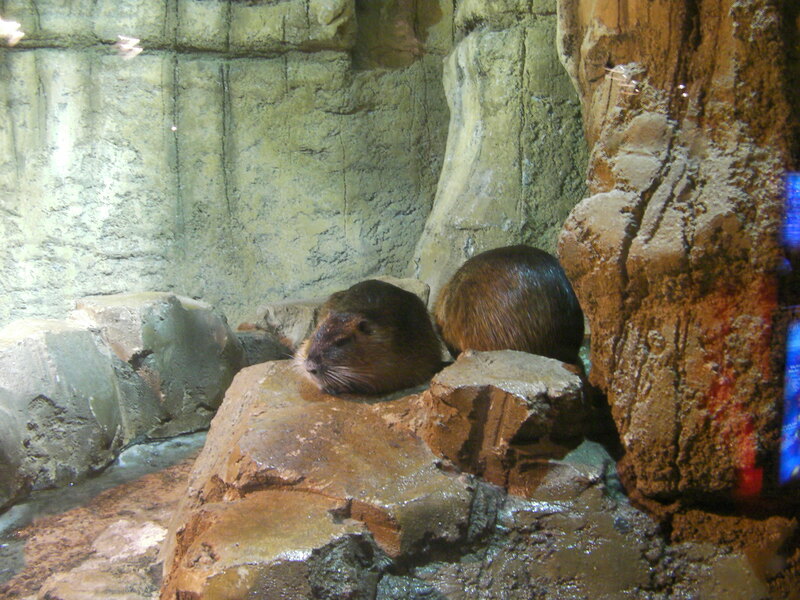 They are nutria. 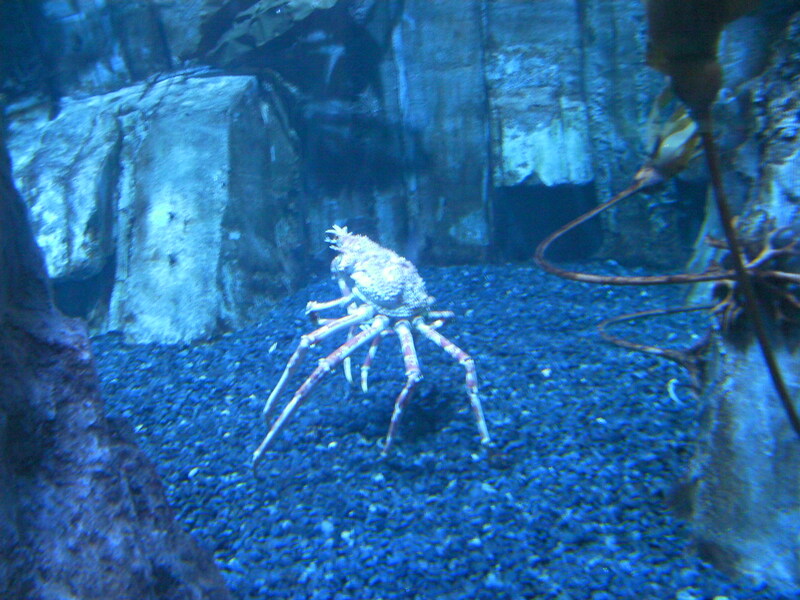 This crab was quite large and tasty looking. There seemed to be a new attraction at the aquarium. Apparently, the divers were more interesting than the fish. We went back to Dubai Mall last night and ate at Taco Bell again. As you can see by the line, it is popular and not particularly fast fast food. Below are our “cheesy fries” which are just fries with nacho cheese sauce poured over them. The fries were good and crunchy and would be much much better without the cheese. Below is Paul’s expression when I take pictures of our food. He thinks I am crazy and is probably embarrassed to be seen in public with me. I know you are all dying to see what we are eating, so I suffer his scorn to satisfy my audience. A toddler at a neighboring table climbed out of his high chair and proceeded to run away. An extremely observant busboy caught him and put him back. Only then did we realize that there was no one else at the table, just a purse and some shopping bags. No parents of this boy to be seen anywhere. The busboy hovered around keeping his eye on the boy and looking for the parents. People at a neighboring table signaled him to move the boy over to their table and they began to take care of him. We left before the parent(s) of this child returned. I hope someone tore them a new one for having left him unattended, but I suppose that is unlikely. We tipped the busboy. He definitely deserved it. We went through the aquarium. 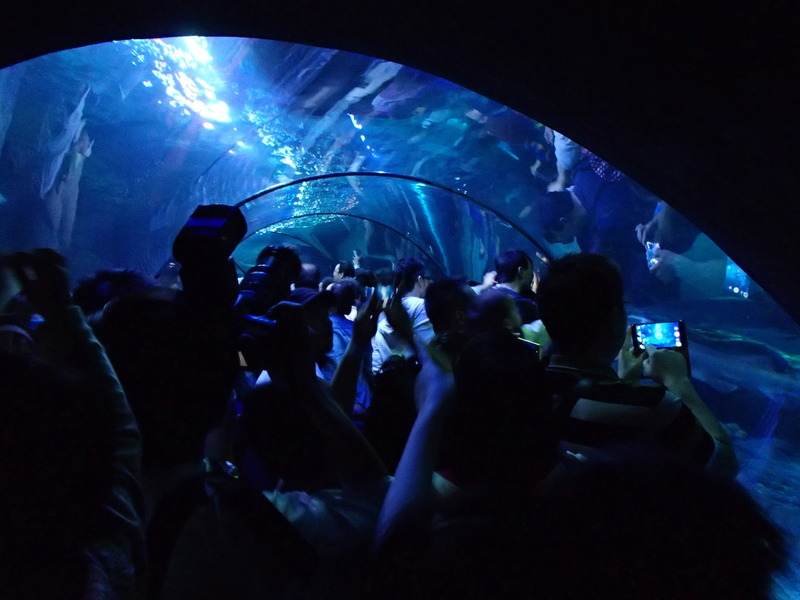 It has two parts — small tank areas with different fish, reptiles, otters, seals, penguins, etc., and the big tank area with the walk through tunnel. There is a serious design flaw, however. You can enter either section, pay once and your receipt will get you into both. The parts are completely separate though. We entered the upper floor with the small tank displays and walked all through it. It exits through the gift shop and back out into the mall. You then have to walk back around past the entrance to the escalators that take you down to the lower floor where the big tank is and you have to walk back around to the far side in order to enter the tunnel. The tunnel entrance is directly below the exit of the upper section, so why they didn’t just design it so that you didn’t have to exit the top floor walk all the way around and back again, I don’t know. A simple elevator or escalator where the gift shop is would have done the trick very nicely. 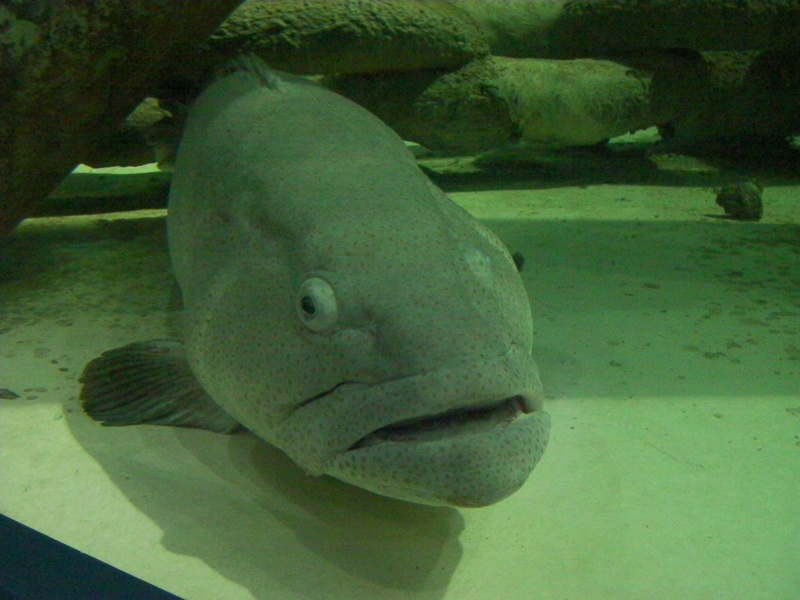 These are pictures of the giant groupers they have in the big tank. They are quite impressive and these pictures don’t do them justice. They can grow to 9 ft in length and these guys looked to be at the 7 ft range. They are related to hamour (brown spotted reef cod), the very tasty fish that is common on menus here. If you get fish and chips, it is most likely to be hamour. When we go into these massive and confusing shopping malls, I am very lucky to have my spacial genius husband to do the navigating. I would have to spend all my time looking at the maps to figure out where to go. Sometimes the maps don’t have the “you are here” indicator, so that increases my fruitless staring at the map time. There are giant led boards displaying ads or national symbols on the sides of the walkways. We were especially amused by the Ribs and Rumps restaurant. Doesn’t that sound appetizing? Here is the one and only Taco Bell in Dubai. Yes, we ate here. The rule is that if we didn’t eat at an American fast food restaurant back home, we won’t eat at it here either. We did our fair share of Taco Bell back home. However, this TB does not have the burrito supreme, but it does have cheesy fries?!?!?!?!? We did not try the fries. There seems to be a rule that you can’t open a restaurant unless it has fries on the menu. The mall has a giant ice skating ring. And a large aquarium. 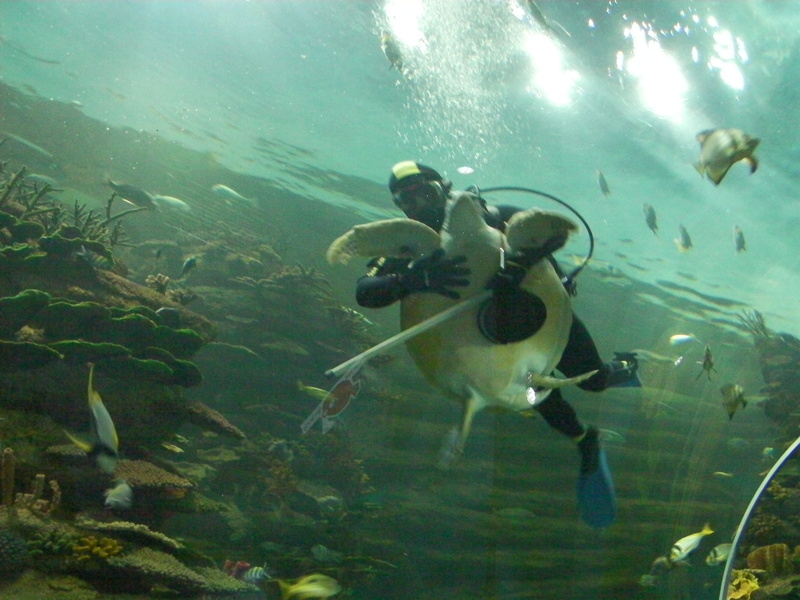 We were too tired of foot to go through the aquarium, but it is on our list of things to do. I love the aquariums where you can walk through the tube and see the fish all around. After they had stocked the tanks they were having trouble with the fish eating each other, especially the big sharks eating the smaller sharks. Go figure! I’m not sure how they resolved this. They have regular feeding times (one of the things advertised on the reader boards), so maybe that keeps the predating down. You are currently browsing the archives for the aquarium category. Twitter – What is Daddybird up to now?